Wooden Cube Shape Sorter is a classic wooden toy which will entertain and teach your little one. 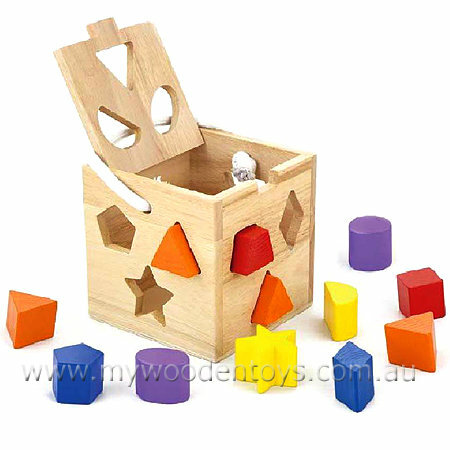 This very solid wooden toy comes with 12 different shapes which can be posted through the right hole into the box. This lovely box has a removable lid so you take the blocks out and start all over again. This is a wonderful toy to help learn shapes and sizes and what small child doesn't like posting things through holes. This toy is also very portable with a lovely cotton rope carry handle. We like this because: "Great classic toy. "